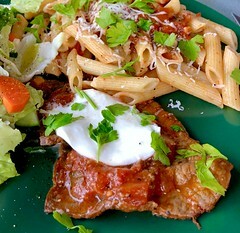 Carne Pzzaiola is a popular way to make steak and was a favorite of my Uncle John. \While you can use leftover pizza sauce (try our recipe) we prefer the traditional make it fresh method. We’ve also suggested two cuts of beef, one is the, thinly cut (traditional) and the other a New York cut. This recipe works with either type so we’ll leave it up to you to choose. 3. Using a combination of olive oil and butter, sear each side of the steak, then remove from pan. 4. Lower the heat, add 2 tbsp olive oil and sauté onions and garlic with the optional Peperoncino Fiocchi (hot pepper flakes). 5. When the onions show signs of transparency and the garlic softens add the 1/2 cup of white wine wine. 6. Add the hand-crushed tomatoes and let come to a simmer. 8. Return steaks to the pan. 10. Serve with a slice of mozzarella and chopped parsley on top.